The deadline is approaching for application for the next round of “Amplify the Arts” grants from the Berkeley Arts Council. The Council is currently accepting applications for the current fiscal year (2012-2013) with a submission deadline of December 17, 2012. We expect the first awards will be announced by the middle of January, 2013. Projects must be completed by June 30, 2013. 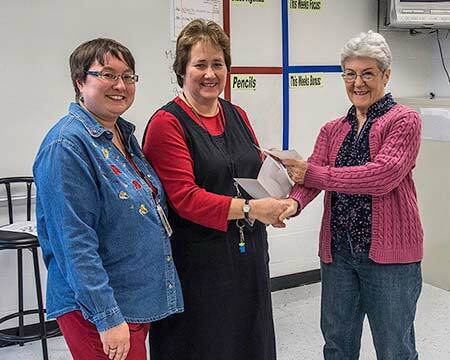 South Middle School Drama Club teachers Joanne Kulp and Sherry Headley received a check from the Berkeley Arts Council for $500. Malinda Shaver presented the award, part of the Council’s first cycle of “Amplify the Arts” grants. Residents, or organizations working primarily in Berkeley County, can be considered for support for projects to expand availability and accessibility of the arts; to involve young people in the arts; to provide arts experiences to new or underserved audiences; to use the arts in an innovative way to enhance community life. Projects must be completed by June 30, 2013. Information and applications are available on the web at www.berkeleyartswv.org/amplify. Email berkeleyartswv@gmail.com.